Ford's average U.S. labor cost, including benefits, is about $57 an hour, $10 more than at the U.S. operations of Fiat Chrysler or Toyota Motor Corp.
Ford Motor Co., beset by the highest U.S. labor costs in the industry, is seeking to use contract talks this summer to ease the burden. GM and Fiat Chrysler have had an advantage, dating back to bankruptcies in 2009, that lets both automakers hire lower-wage workers in unlimited numbers. Ford, by contrast, has had to give 48 percent raises to more than 800 factory employees this year. Ford gets a chance to remedy the imbalance starting today when it opened talks with the UAW on a replacement for the four-year contract that expires Sept. 14. Ford has complained that its labor costs have ballooned above those of its domestic competitors because it isn't subject to the same terms in a wage system that has enabled the Detroit Three to hire 39,150 workers in the last four years. Ford's plan is to take the lead in contract talks and set the pattern for UAW wages and benefits for General Motors Co. and Fiat Chrysler Automobiles NV. 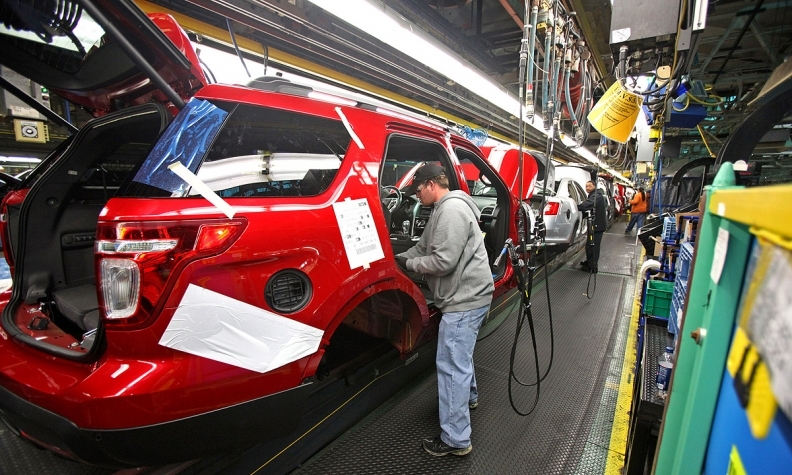 "We feel ready," Bill Dirksen, Ford's vice president of labor relations, said last month. "We have some differences which are the result of what the industry has gone through the last several years. It's creating some relatively unique circumstances with regard to labor costs." For the first time in more than a decade, the U.S. automakers and their union enter contract negotiations this month that are not under a cloud of economic disaster. Still, the companies are trying to resist reverting to old free- spending ways, especially with the U.S. auto expansion slowing in its sixth year. The union believes it's payback time. These talks will set terms for more than 137,000 autoworkers, representing $17 billion in wages and benefits, according to estimates by the Center for Automotive Research. Ford ended up with Detroit's most expensive labor contract because it didn't seek bankruptcy protection back in 2009 like GM and Chrysler. Those companies have since been allowed to hire as many so-called second-tier workers as they want starting at "entry-level" pay of $15.78-an-hour, while only a limited slice of Ford's workforce can be paid less than the top-end $28.50 rate. Back in the dark days of 2007, the union agreed to the two- tier system, with less-expensive benefits and lower pay, to try to end losses at the Detroit Three. During the government- sponsored bankruptcies of GM and Chrysler in 2009, those companies were given the freedom to hire an unlimited number of workers at the lower wage. Only Ford still has a cap that requires a maximum of 28 percent of its labor force receive the lower pay. Ford hit that threshold early this year, which triggered a clause requiring some of the entry-level workers' pay be bumped up to $28.50, the rate veteran workers receive, from $19.28, the top end of the second-tier wage scale. The company said it has given that hefty raise to more than 800 workers since February. As a result, Ford's average U.S. labor cost, including benefits, is about $57 an hour, $10 more than at the U.S. operations of Fiat Chrysler or Toyota Motor Corp., according to CAR, based in Ann Arbor, Mich.
Chrysler has hired 15,050 workers since 2011, leaving 45 percent of its workforce earning the lower wage. GM, which has hired 9,100 workers since 2011, has seen less benefit and has average U.S. labor costs of $55 an hour, according to CAR. Fewer than 25 percent of its workers have the lower wage. In the meantime, senior workers haven't seen an increase in their base wages for years. "You've got a lot of pent-up demand among workers for raises," said Harley Shaiken, labor professor at the University of California at Berkeley. "It's going to be complex and tough." Shortly after Labor Day, the union will select one automaker to negotiate with exclusively to set the pattern of major economic terms for all three companies. Ford is aiming to be that company to get its costs back in line with GM and Fiat Chrysler, which began talks earlier this month. "Ford will try to negotiate an increase of the percentage of workers they have on the lower tier by arguing they need that in order to remain competitive," said Gary Chaison, a labor professor at Clark University in Worcester, Mass. "The UAW will resist this strenuously." The union is eager to end the two-tier wage system and to give raises to all of its members, including senior workers who have been stuck at the $28-an-hour wage for nearly a decade. "They've got too many damn tiers," UAW President Dennis Williams told delegates at the union's bargaining convention in Detroit in March. "Our goal is to raise everybody up and bridge the gap" between new hires and veteran workers. Ford and GM, even with the higher labor costs, are more profitable than Fiat Chrysler. Ford's net income fell 56 percent last year to $3.19 billion, while GM's earnings slid 26 percent to $3.95 billion and Fiat Chrysler's declined 37 percent to 568 million euros ($755 million). 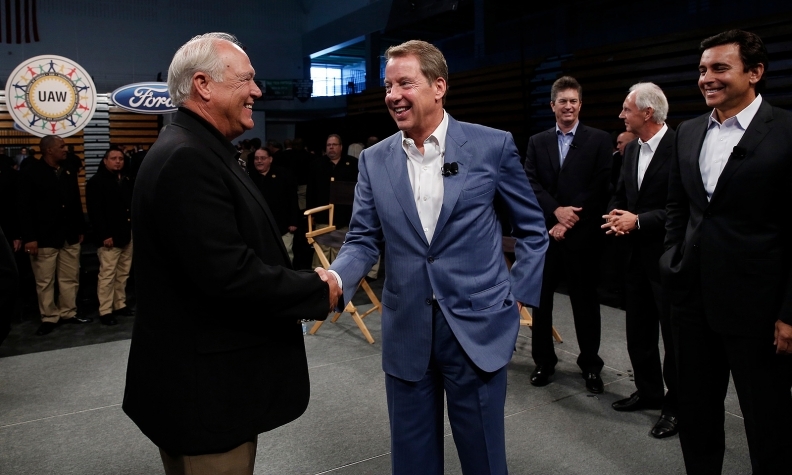 UAW President Dennis Williams, left, shakes hands with Ford Motor Co. Executive Chairman Bill Ford, center, as Ford CEO Mark Fields, right, looks on during the ceremonial start of labor negotiations in Detroit today. "The union membership is saying, 'It's our turn,'" said Kristin Dziczek, director of the Industry & Labor Group at CAR. "'We gave you the ability to compete and in the last five years you have been fantastically profitable. It's time to pay us.'" The union has more muscle than it has had in almost a decade because the UAW has the ability to strike at all three companies in these negotiations. Workers at GM and Chrysler forfeited that right in the last two rounds of bargaining as part of bankruptcy proceedings. Dziczek sees a strike as a possibility this year, if only to convince workers the union got everything it could at the bargaining table. "A strike helps solidify that you didn't leave stuff on the table, that you went up to the line and over it," Dziczek said. "It helps with the ratification of an agreement." Yet even with the threat of a walkout, the union is unlikely to eliminate the second tier in these talks, Dziczek said. It is likely to take two rounds of talks -- or eight years -- for junior workers to grow into the senior wage, she said. The fate of the second tier is the talk of the factory floor at Ford's axle plant in Sterling Heights, Mich., which is working overtime to pump out parts for new F-150 pickup, said Brian Pannebecker, a hi-lo operator at the factory. "The second-tier people are all excited, thinking that they're going to move up to where we're at," said Pannebecker, who makes $28.50 an hour after 19 years on the job. "But the guy next to him hasn't had a raise in 10 years and he's thinking, 'You're going to get $4 or $5 an hour more because I'm not getting anything. It's coming out of me.'" Ford showed its willingness to rattle the saber by announcing last month it's moving production of slow-selling small cars and hybrids out of a Michigan factory. The company told union officials the Focus and C-Max models will be produced outside the U.S., most likely in Mexico, according to a person familiar with the discussions. "The company will argue that any type of extravagant arrangement may result in more jobs being sent overseas," Chaison said. "They're essentially saying, 'There's nothing special about Michigan any more. We can make cars in other countries and export them back to the U.S.'"
Williams said Thursday that he has “a lot of issues with Mexico,” where Ford and other automakers are investing and expanding. John Fleming, Ford’s global manufacturing chief, declined to say what products would replace the models being pulled out of the factory in Wayne, Mich.
Fleming said Ford is moving the work to improve profits.